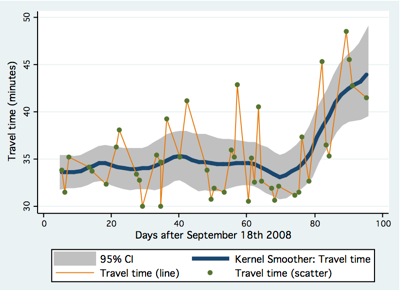 Carrion and Levinson (2012) studied the bridge choice behavior of commuters before and after a new bridge opened to the public. This bridge replaced the previously collapsed I-35W bridge in the metro area of Minneapolis-St. Paul. The original I-35W bridge collapsed on August 1st, 2007, and the replacement bridge opened to the public on September 18th, 2008. This study extends Carrion and Levinson (2012) by considering explicitly the day-to-day behavior of travelers, and by also considering the previously excluded subjects that are transitioning between bridge alternatives not including the I-35W bridge. The primary results indicate that the subjects react to day-to-day travel times on a specific route according to thresholds. These thresholds help discriminate whether a travel time is within an acceptable margin or not, and travelers may decide to abandon the chosen route depending on the frequency of travel times within acceptable margins. The secondary results indicate that subjects previous experience, and perception of the alternatives also influence their decision to abandon the chosen route.